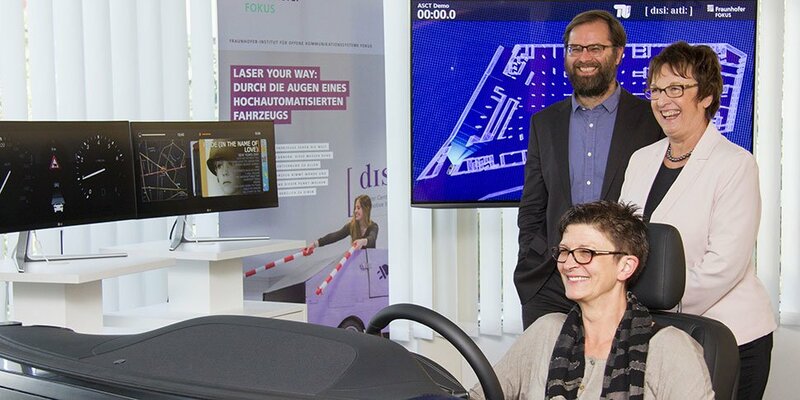 Brigitte Zypries, the Parliamentary State Secretary of the Federal Ministry for Economic Affairs and Energy and Saskia Esken, Member of the German Parliament informed themselves about the latest research on automated and connected driving. On Monday, September 7, 2015 they visited the “Smart Mobility Lab" at Fraunhofer FOKUS. What role could autonomous driving play in future mobility concepts? In the last years, mobility has experienced fundamental changes. Connected cars, autonomous or automated driving, collaborative mobility, integrated and smart mobility are just a small selection of important topics in this context. A central element is the connection of vehicles with other vehicles, traffic management centers, traffic lights, public transportation, pedestrians and many more. The director of the competence center ASCT, Dr. Ilja Radusch, informed the Parliamentary State Secretary on how information and communication technologies modernize traffic and build up public infrastructure in smart cities. “Automated and connected driving as part of modern mobility concepts in urban development contributes new opportunities for Germany as industrial location. I am pleased that our research partner Fraunhofer FOKUS carries out such important pioneering work with its applied solutions. Innovative forms of mobility enable new perspectives on the way we move. We consider different application scenarios and are thus able to recognize changing habits and needs of residents in rural or urban areas" said the Parliamentary State Secretary Brigitte Zypries. During a tour through the lab at the end of her visit she had the opportunity to have a close look at how these developments could look like.